Email or message Anne to find out her availability. Anne will respond within 48 hours. Then give her a call for a customized rate at 530-541-2575 (U.S. Pacific Time Zone). Anne would love to talk with you and learn all about your event! NOTE: The final scheduling of your event is completed by phone or in person only. Do you prefer to speak with Anne’s booking representative? Contact Ed Miller at 530-525-5201. Q. How much does Anne charge? A. Your event is unique, and Anne will provide a special quote to cover it all when you give her a call at 530-541-2575. Be ready to supply her with all your details, including the date, time schedule, and location of your event. That’s why you don’t see a price list here—Anne prefers talk with you so that she can work with your music and budget expectations. Ask Anne about her All Day Package, a bargain for multiple performances throughout the day. Or ask Anne about her Wedding Budget Package, designed for elopements and intimate weddings. She even has a special discount for marriage proposals! Q. How far in advance do I need to contact Anne? A. Contact Anne as soon as you know you’d like to invite her to perform. It’s not unusual for Anne to hear from interested wedding couples and festival producers a year or two in advance. You can also contact Anne at the last minute, too, even on the day of your event! If Anne is not available, she will be happy to refer you to other entertainers to fit your live music needs. Q. Is Anne willing to learn a special song for me? A. She might already play your favorite song, even if it isn't presently on her playlists. Anne prides herself on being able to play just about anything a DJ can play. In fact, if your music request is new to her, Anne may be able to learn it in time for your event! Call Anne for details. Q. How will my guests hear the harp? A. For small numbers of guests, Anne’s normally acoustic harp is easily heard without any amplification. When guest numbers exceed 50, Anne uses a microphone and small amplifier so that everyone can comfortably hear her music. The natural sound of the harp is not altered—No need to worry about disturbing the neighborhood with loud reverb! When electricity is unavailable, Anne uses a battery powered sound system, so running cords to a far away or nonexistent electrical outlet is unnecessary. For large audiences and concert performances, Anne can provide her own PA system (electricity will be required). 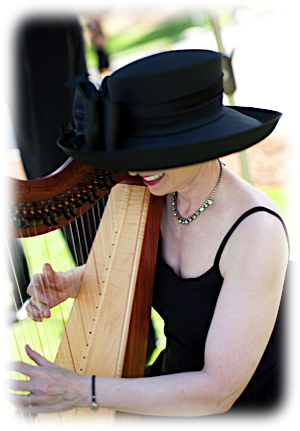 There is no charge for amplification, because Anne wants to be sure everyone can enjoy her harp music. Q. How can I sample Anne's music? A. You have many opportunities to check out Anne’s music to make sure it is perfect for your event. Listen to Anne Roos’ wedding music samples, harp music videos and CD sample tracks on this website. Go to iTunes and Amazon.com to sample tracks from Anne’s CDs, too. For a live music experience, see Anne perform in concert, and make sure to let Anne know you'll be attending. Live auditions, in person or by phone (via speakerphone or Skype), are available by appointment. Phone Anne at 530-541-2575 to schedule a private audition. Q. Can Anne perform with other musicians? A. Anne knows many professional musicians—vocalists, flutists, violinists, guitarists, pianists and more—so she can easily create an ensemble to your liking. Phone Anne for more details. Q. What will Anne wear at my event? A. The visual presentation for a live harp music experience is just as important as the music being played. Anne Roos strives to fit with the theme, colors, and formality of your event. Her extensive wardrobe even includes period costumes! Check out Anne’s photo gallery and call her for ideas at 530-541-2575. There is no extra charge for this service. Q. Is Anne willing to travel to perform at my event? A. Yes! Anne is located at Lake Tahoe, and she’s willing to travel just about anywhere to perform for you. Of course, additional fees may apply. Contact Anne Roos for celebrity weddings and platinum weddings, house concerts and variety shows, festivals and conventions, and corporate and black-tie events. Reach out to Anne’s booking representative, Ed Miller, at 530-525-5201. Q. Does Anne charge for consultations? A. There is never any fee for consultations and auditions. Give her a call, and she’ll supply you with the event rates or wedding quotes you need. She looks forward to hearing from you. Anne is also happy to offer referrals for other services you may need, too. For weddings, be sure to visit Anne’s list of preferred services on her wedding links page.